The books shown at the left are the most popular Thienna books. Click on them to see details. Did you ever wonder about the following? Why do men tend to have darker skin than women? Why do the poorest countries have the darkest people? Why do some African American celebrities seem to get lighter over time? Why do I have a tan even when I do not go out in the sun? If so, Unlocking the Mystery of Skin Color is a must read for you. Thienna was born in Vietnam where white skin is treasured as a characteristic of beauty. Her mother, sister and brothers had a light complexion but she did not. This caused Thienna much distress. By the time Thienna was twelve years old, her family moved to San Francisco. She tried several things to lighten her skin but it only darkened it. Thienna came to the conclusion that scientific research did not have the answer to her questions. Since Thienna is a nutritionist, she started her quest by investigating how nutrition influences skin color. She was able to make many connections between what people eat and their skin color. As the author continued her research and experimentation, her skin color lightened. It is important to point out that she did not use any toxic or botanically based chemicals, no drugs and no steroids. The author gives us some very interesting facts regarding Von Luschan’s Chromatic Scale, the first tool used to classify skin color. Thienna points out that melanin is the basic building block of your skin pigment; however, its characteristics make it very difficult to study. The author states that one of the most important determinants of skin color is the amount of sulfur in the skin. If you change the amount of sulfur in the pigment producing layers of your skin, you can change the skin color. Another factor in determining skin color is the environment. Thienna gives the reader detailed information on selecting a diet that is good for the skin and tells us about foods and drugs we should not even touch. 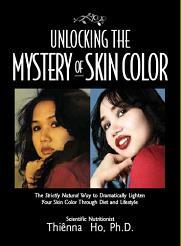 Unlocking the Mystery to Skin Color is an intriguing and interesting book. It is very obvious that the author has done much research in order to be able to write this book. This book is easy to understand and gives the reader a thorough history on skin color. Throughout the book there are sections called “Warning” where the author advises the reader on what they should not do. There are several photographs, charts and lists to help the reader understand the points the author is making. The reader will also find a lists of “Dos and Don’ts” in order to have fantastic skin. Thienna backs up her research with several before and after photos of people who have been able to lighten their skin by using her method. If you are interested in changing your skin color or want more information about restoring damaged skin, this is the book for you. The author has done a thorough job in writing this book and if you ever had any questions regarding skin color, I’m sure you will find the answers here. As the author states, skin color is not fixed. Thienna gives the reader plenty to think about. I know it made me do a lot of thinking as I read this book. Unlocking the Mystery of Skin Color is highly recommended.